The Tom Dixon Band Live! Join us this week as we welcome the country music band, The Tom Dixon Band. With a unique combination of smooth country vocals and an explosive live performance, The Tom Dixon Band has given birth to a new way of delivering that sweet country sound, with a heart pumping, foot-stomping beat that can only be viewed as a bit spicy, smooth, southern country rock. In 2012 The Tom Dixon Band is touring the east coast from Maine to Virginia. 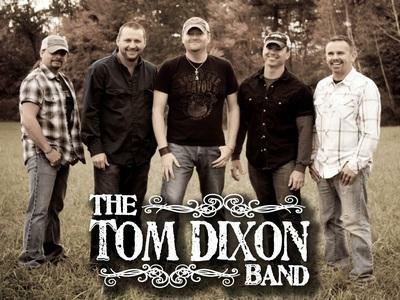 The Tom Dixon Band has been invited to perform in many high profile venues where they deliver the opening performance for such notable acts as Alan Jackson, The Zac Brown Band, Sugarland, Phil Vassar, The Nitty Gritty Dirt Band, Kip Moore and Dusty Drake as well as live back-up vocals & rhythm guitar for Nashville's own Crossin’ Dixon. We will talk with them about their upcoming schedule, get a behind the scenes look at their music, feature songs from thier latest album "Truckin" and ask them to share her efforts to support the troops. Please be sure to visit The Tom Dixon Band at http://www.tomdixonband.com/ and spread the word. Fans are welcome to call in and chat live with The Tom Dixon Band during the show. If you would like to participate in the live chat during the show, you must sign up on the show site first and then log in during the show. More great music for a really great cause! And as always we will give shout outs to our deployed military listeners. Be sure to join us, Sunday September 16th 2012 at 4:00 PM EST! Our message to the troops....WE do what we do, because YOU do what you do.